for £5.99 postage paid world-wide. At first sight it seems as if Alto have thrown everything but the kitchen sink into something of a hotch-potch but with almost 75 minutes of splendid music in fine performances and recordings at bargain price, I, for one, am not complaining. There are a couple of very good budget versions of the Octet - Music from Aston Magna on period instruments (Harmonia Mundi: currently download only from iTunes or emusic.com - October 2008 DL Roundup) and the Gaudier Ensemble (imminent reissue on Hyperion Helios CDH55460 - review of earlier incarnation, April 2012/2 DL Roundup) but they both come without any filler, while the Vienna Octet version is still available from Decca, with the Spohr Octet, albeit more expensively than on this Alto release (Legends 4665802). 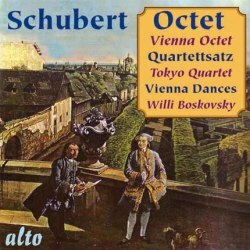 Even the two Australian Decca Eloquence releases, of the 1954 mono Vienna Octet version (4803431, 2 CDs, with ‘Trout’ Quintet and Mendelssohn Octet) and their 1958 stereo remake (4802403, 2 CDs, with Beethoven Septet, String Quintet and Sextet) are not quite such bargains in the UK any more unless ordered from Australia. Those Decca CDs are re-mastered from the original tapes, while the Alto is presumably taken from a good copy of the original stereo LP. Whatever the source, dinmore-records.co.uk have made a very good job of the transcription with which they are credited. I enjoyed the Beulah Extra reissue of the Vienna Octet’s earlier (1948) performance (5-10BX168: 2012/1 DL Roundup) but this recording from ten years later sounds better still. Music from Aston Magna and the Gaudier Ensemble observe more repeats than the Vienna Octet, especially in the first three movements, so you get less of this gorgeous music on Alto but you are unlikely to notice unless you are sitting with the score in front of you. An hour plus would have been unfeasible for a stereo LP in 1958. The 1948 Vienna Octet version was slightly shorter still, presumably to cope with the problem of fitting on 78 sides, but I wouldn’t let such considerations prevent you from obtaining one or both of their fine accounts of this delectable music. Good as the Gaudiers and the Aston Magna performers are - very good, indeed - the Vienna Octet of 1958 were past masters at giving the music a little extra lift, as in their recording of the ‘Trout’ Quintet with Clifford Curzon (Beulah Extra 1-3BX41 or from High Definition Tape Transfers - see February 2012/2 DL Roundup). There’s one other version that I should mention. Alongside the Gaudiers I reviewed a Wigmore Hall recording made by distinguished soloists working together so well that you wouldn’t think they didn’t perform regularly as a team (WHLive0017) in April 2012; that comes with a substantial filler in the form of Der Hirt auf dem Felsen and the classicsonline.com download is also inexpensive, and the CD comes at mid price. The Tokyo Quartet recorded the single-movement Quartettsatz for Vox, not to be confused with their later version on Harmonia Mundi with the String Quintet. That recording, released in the UK on Conifer, came with Quartet No.14, Death and the Maiden. As with the Vienna Octet’s performance of the main work, they omit the repeat. In other more positive respects, too, you might be forgiven for thinking that the Viennese team was at work here; I hope that Alto or someone else will also resurrect their Death and the Maiden some time soon. I said I wasn’t complaining about the varied provenance of the parts of the Alto CD, but I do hope that the inclusion of some items from the wonderful Vanguard series of small-scale dance music by the Boskovsky Ensemble doesn’t preclude Alto from reissuing more from that series. The parent LPs and the Vanguard CDs have been in and out of the catalogue so many times, including appearances on Fontana with sickly pink covers. Mostly they’ve been out of availability, so I’m glad to see any part of them return. I was lucky enough to snap up the whole series on CD; you can still find the odd copy for a premium price and there are a couple of inexpensive download versions whose quality I can’t vouch for, but it would be nice if Alto were to do the honours. Gräzer Galop and Ecossaisen Galop are taken from Greetings from Vienna (last seen on 08801771), the Ecossaisen, Op.49, and Tänze from The Charm of Old Vienna (08801671). That leaves the whole one hour contents of Wiener Bonbons (08801571), eight Waltzes and Ländler by Schubert which wouldn’t quite have fitted on the Schubert Octet CD and other delightful music by Mozart, Lanner and the Strauss Family, plus more Lanner, Strauss Family and Beethoven - yes, even he wrote Ländler and Contredanses - on the other two albums, more than enough for two CDs. I presume that the Octet has been re-mastered from LP but the other items have been licensed and presumably taken from master tapes. Whatever the case, the recordings all sound much more than acceptable. There’s even a decent set of notes to put some other budget labels to shame, though emphatically not Hyperion, so the only serious criticism I can make of this reissue is that the cover design, like so many from Alto, looks like a budget offering.